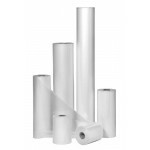 PRICE PER ROLL Office Grade 1.5 mil thick, 500' Long Roll Lamination Film 1", 2.25" or 3" Core Size Poly-In or Poly-Out Available in multiple widths. Select your width to the right. PRICE PER ROLL Office Grade 3 mil thick, 250' Long Roll Lamination Film 1 Inch, 2.25" or 3" Core Size Poly-In or Poly-Out Available in multiple widths. Select your width to the right. PRICE PER ROLL Professional Grade 5 mil thick, 250' Long Roll Lamination Film 1 Inch, 2.25" or 3" Core Size Poly-In or Poly-Out Available in multiple widths. Select your width to the right. Professional Grade 10 mil thick, 100' Long Roll Lamination Film 1 Inch, 2.25" or 3" Core Size Poly-In or Poly-Out Available in multiple widths. Select your width to the right.